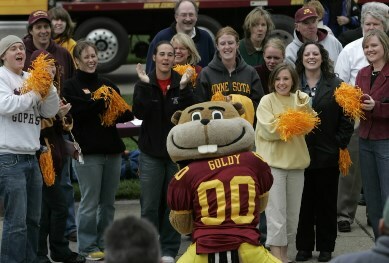 More mascot drama: Who really invented Goldy Gopher's 'head spin' move? Last week, it was Ragnar. This week? It's Goldy Gopher. The genesis of this dust-up is a recent piece in the New York Times about Goldy and who created his signature move. Last week, it was Ragnar. This week? Goldy Gopher. I don’t go looking for mascot controversies (promise), but somehow they keep finding me. The breakup and contract dispute between the Vikings and longtime mascot Ragnar was one thing, but this is something else: a question (possibly even a dispute) over who invented Goldy Gopher’s famous “head spin” move. “I was trying to entertain 10,000 drunk people, just trying to do something to get some laughs,” he said. “Whenever I would do it, the fans would go nuts.” It quickly became part of the act. But … an informal group of former U of M band members and former Goldy Gophers remember things a little differently. I talked with Brent Turner, a marching band member from 1986-1990, who says there is evidence of Goldy’s head spin that predates Bernstein’s time as the mascot. He and others of that era have been trading Facebook messages over the past several days and are convinced the head spin goes back at least to the early 1980s — and that it neither has its roots in hockey nor was invented by Bernstein. Without that evidence, I guess this is just a “Goldy Said vs. Goldy Said” argument. Maybe we can all agree at least that it’s a great move? Poll: Let's settle this. Who's your favorite mascot?